Lipofuscin is a waxy heterogeneous substance that is comprised of aggregates of metabolic cellular waste end products, which reside within the lysosomes and cytosols of particular types of human cells. This substance can neither be degraded further via the typical complement of lysosomal enzymes, nor ejected from cells, but can be somewhat diluted through cell division and subsequent cellular growth. This autofluorescent pigment is considered to be a significant aging-associated “wear-and-tear” compound that is found in the liver, kidney, heart muscle, adrenals, nerve cells and ganglion cells. It is specifically arranged around the cell nucleus, and is a type of lipochrome. In a broader context, lipofuscin is often considered as one of several forms of undesirable proteinaceous agglomerations; others sometimes called ceroids, inclusion bodies, plaques, or aggresomes, contingent on their source and composition. It accumulates over time within aging cells to become manifest as a significant percentage of a cell’s internal volume. As a consequence, it may impede normal cellular processes, affecting proteasomal activity and protein turnover, and is present as typical feature in neurodegenerative diseases as well as aging. Within the aging human brain, deposits of lipofuscin are not uniformly distributed, but rather, are concentrated at specific sites of functional interest. The prevailing thought is that the major source of lipofuscin is derived from the incomplete lysosomal degradation of cell membrane lipids and damaged mitochondria. “Although entirely conceptual and seemingly impracticable currently (2013), advanced AI [Artificial Intelligence] involvement in the design/optimization of sophisticated nanomedical devices working in conjunction with mature nanomanufacturing may indeed bring about much more complex, albeit far more rapid and efficient lipofuscin detection and removal. Advanced autonomous nanodevices might precisely locate lipofuscin granules by exploiting its strong fluorescence signatures (emission spectrum ranges from 450 to 700 nm)  …. to match with onboard reference spectral profiles. The prospective armamentarium at the disposal of these autonomous diamondoid “defuscin” class nanodevices…. might allow for the complete eradication of lipofuscin aggregates utilizing a feedthrough digestive strategy. These entities may be propelled by arrays of oscillating piezoelectric “fins” or via integrated magnetic nanoparticles, which might be activated and controlled externally. The conical inlet port of the nanodevice would be lined with molecules that possess high affinities for A2E [a primary lipofuscin constituent] and other lipofuscin elements. Once a lipofuscin granule has been captured it would proceed to be drawn into the core, where it would be digested by potent encapsulated enzymes or nanomechanically minced into a liquid state and subsequently purged from the outlet port. This functionality would be similar to Freitas’s microbivore artificial mechanical phagocytes, which operate under a “digest and discharge” protocol” . “The desired result of this defuscin mediated digestion would be the fragmentation and ideally dissolution of the chemical crosslinks that provide lipofuscin its refractive properties. Other defuscin-class nanodevice designs may include proboscises that serve dual purposes; as potential electrodes for highly localized hyperthermic interventions, following insertion into the lipofuscin mass, or hollow nanosyringes… for the injection of powerful cleaving enzymes. The nanomechanical segmentation or disassembly of individual lipofuscin granules at atomic/molecular resolution may be possible employing arrays of diamondoid “debriders” to reduce lipofuscin to its most elemental and harmless fractions. Larger fragments could subsequently be encapsulated for egress through the urinary or gastrointestinal tracts. Eichhoff, G., Garaschuk, O., Two-photon imaging of neural networks in a mouse model of Alzheimer’s disease. Cold Spring Harb Protoc. 2011(10), 1206-16, 2011. Freitas Jr., R.A., Microbivores: Artificial Mechanical Phagocytes using Digest and Discharge Protocol, J. Evol. Technol. 14, 1-52, 2005. This book endeavors to explore a significant range of conceptual nanomedical components, devices and systems, as well as to present some of the latest real world laboratory-based research, which may lead to the development of advanced and highly efficacious nanomedical technologies. This volume is trisegmented; the initial segment utilizes an envisaged conceptual exemplar nanodevice and system (Vascular Cartographic Scanning Nanodevice – VCSN), which the author has evolved, to explore various potential design considerations, which might enable specific functionalities of sophisticated autonomous nanomedical devices. The second segment is comprised of chapters that have been contributed by world class experts in the field, who present and articulate pioneering laboratory-based nanomedical research. The final segment investigates more highly conceptual nanomedical possibilities and visions relating to the implementation of advanced nanomedicine in remote regions and the developing world, as well as nanomedicine in space applications, human augmentation and longevity. 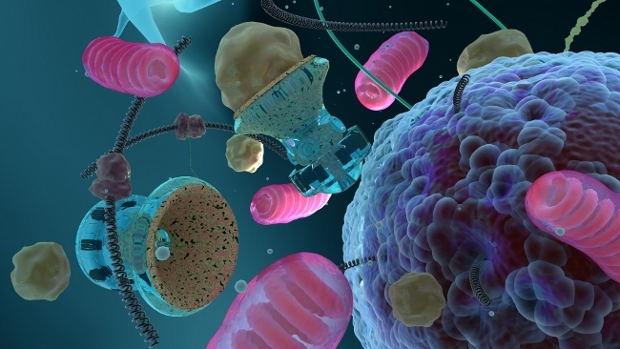 Nanobotmodels Company, in collaboration with the editor of Nanomedical Device and Systems Design: Challenges, Possibilities, Visions (FJ Boehm), have created artistic representations of a conceptual advanced “defuscin” (lipofuscin eradication) nanodevice. Nanobotmodels was established in 2007 with the goal of developing highly innovative, digital graphics to depict actual and conceptual technologies via the synergistic fusion of art and science. The still nascent, yet prospectively powerful discipline of nanotechnology is poised to radically transform medicine, engineering, biotechnology, electronics and myriad other sectors in the relative near-term. Hence, visionary artistic renderings that portray various aspects of this exciting nanofuture will be beneficial in facilitating a clear understanding of its fundamental concepts to a broad demographic. Nanobotmodels generates imaginative and engaging state-of-the-art nanotechnology and nanomedical illustrations and animations. Any prototypical component, device, system or far flung concept that might be conceived of can be translated into captivating and colorful photorealistic animated or static renderings and presentation materials…. We bring them all to life for you! Nanobot Models was founded in 2007 and its goal is to develop modern interdisciplinary intersections between art, science and technology. They expect nanotechnology to boost medicine, engineering, biotechnology and electronics soon, so artwork and visions of the nanofuture will be very useful. They make hi-end nanotechnology and nanomedicine illustration and animation. If you can imagine an interesting animation, illustration or presentatio, we can make it real.The level of detail in each medical illustration can be used to simplify complex structures and make them visual attractive. Their clients include largest medicine photobanks, nanotechnology magazines and publications, educational organization and private companies. Nanorobot Models was founded by CEO Svidinenko Yuriy, futurist and nanotechnology artist.Their team consist of modern artists, modelers and nanotechnology scientists. Their headquarters are located in Ukraine, Melitopol. Including in tears and mucus- correct? Interesting. However, it’s not clear whether there is a power density threshold beyond which such a technique loses its effect. If there is no threshold then IR light could be used through the skull. It is quite transparent at the wavelengths mentioned. From an evolutionary POV why the skull should be so transparent to IR is interesting.